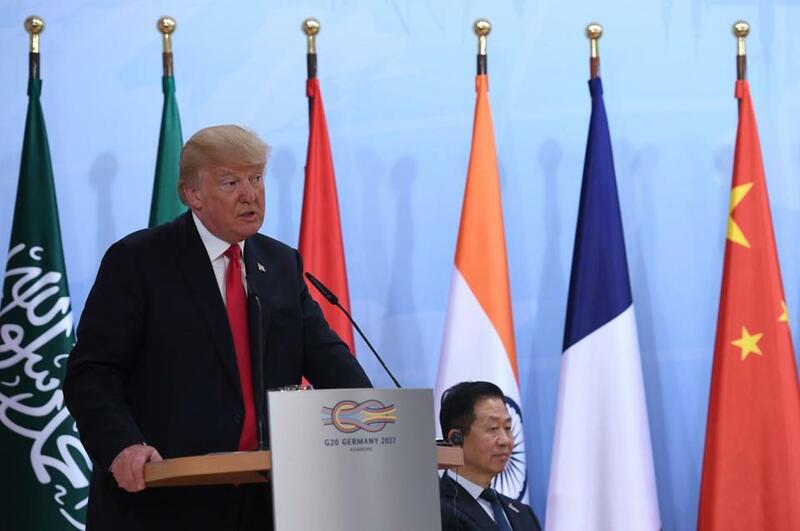 President Donald Trump spoke during a panel discussion on the second day of the G20 Summit in Hamburg. HAMBURG, Germany (AP) — Fresh from his lengthy head-to-head encounter with Russian President Vladimir Putin, U.S. President Donald Trump on Saturday dove into discussions on trade and North Korea in a packed agenda with world leaders at an international summit. Wrapping up his second trip overseas, Trump was meeting later in the day with President Xi Jinping of China as the U.S. sought to forge a consensus on how to counter North Korea’s push to develop its ballistic missile and nuclear program. The White House has tried to pressure Beijing to rein in North Korea but Trump has expressed frustration with the process. Trump said he had a ‘‘tremendous meeting’’ with Putin as he sat alongside British Prime Minister Theresa May on the sidelines of an international summit in Germany. It marked Trump’s first comments on his high-profile talks with Putin in which he raised the issue of Russia’s meddling in the 2016 elections and discussed plans for a cease-fire agreement in Syria. It was the president’s final day of meetings at the annual Group of 20 summit, which have been marked by violent riots in the city between anti-globalization activists and police. May was the first foreign leader to visit Trump at the White House and he told her he would soon ‘‘be going to London’’ once details were worked out. Independent trade negotiations between the two countries are a possibility as Britain exists the European Union — a move Trump has supported. Trade was also on Trump’s mind as he met President Joko Widodo of Indonesia. The president said he planned to do ‘‘lots of deals’’ with Indonesia and expressed hope of bolstering their trade ties. Trump’s meeting with Xi, meanwhile, was coming at a delicate time in the relationship between the two global powers. The Trump administration is investigating the possibility of putting new barriers on steel imports based on national security considerations, a move that could target China, which has flooded international markets with cheap steel exports. Trump has pressed Xi to help stop the U.S. stop North Korea’s development of nuclear weapons before they have the ability to threaten the U.S. homeland. The administration wants China to fully enforce international sanctions intended to starve Pyongyang of revenue for its nuclear and missile programs. The stakes have become more significant after North Korea’s recent test-launch of an intercontinental ballistic missile. The successful test launch is a major milestone in the North’s long-term effort to build a missile that could carry a nuclear warhead to attack the United States. Earlier in the week, Trump vented on Twitter that trade between China and North Korea had grown nearly 40 percent at the start of 2017. ‘‘So much for China working with us - but we had to give it a try!’’ Trump officials said later that the president hadn’t given up on the relationship. Trump’s long list of meetings with world leaders on Saturday also included Japanese Prime Minister Shinzo Abe and Prime Minister Lee Hsien Loong of Singapore. He also joined a women’s entrepreneurial finance event, a project spearheaded by his daughter and senior adviser Ivanka Trump. Trump planned to return to Washington on Saturday evening after the conclusion of the annual Group of 20 meetings. He won’t be stateside for long. The president is scheduled to return to Europe next week to attend Bastille Day celebrations in Paris. The European trip to Poland and Germany has centered around the exchange with Putin, Trump’s first in-person meeting as president. But both sides offered differing explanations of what took place. U.S. Secretary of State Rex Tillerson said Trump and Putin had a ‘‘robust and lengthy’’ discussion about the election interference but Putin denied any involvement. His Russian counterpart, Foreign Minister Sergey Lavrov, said Trump had accepted Putin’s assurances that Russia didn’t meddle in the U.S. election — a characterization that the U.S. disputed. ‘‘I think the president is rightly focused on how do we move forward from something that may be an intractable disagreement at this point,’’ said Tillerson, who took part in the meeting along with Lavrov. Trump’s meeting with Putin, which was originally scheduled for 35 minutes, wrapped up after more than 2 hours, and focused heavily on a just-announced cease-fire deal for southwestern Syria that was reached by Russia and the United States. Trump will hold meetings with British Prime Minster Theresa May, President Joko Widodo of Indonesia, Prime Minister Lee Hsien Loong of Singapore, Japanese Prime Minister Shinzo Abe and President Xi Jinping of China. He’ll also attend a women’s entrepreneurship finance event and participate in various sessions with fellow Group of 20 leaders. The second day of the summit of world leaders that has been overshadowed by violent riots between anti-globalization activists and police is expected to include talks on global trade, climate change and international terrorism. Trump is set to return to Washington Saturday evening. Associated Press writers Jill Colvin and Vivian Salama in Washington contributed to this report.